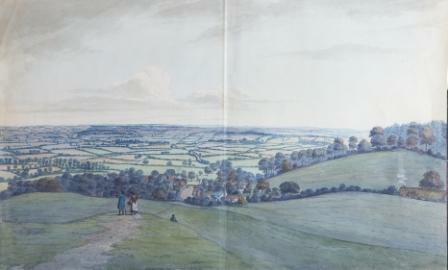 Two outstanding topographical artists, Thomas Fisher and George Shepherd visited Bedfordshire, separately, between the years 1811 and 1822 and have left us with paintings which enable us to see what places around the county looked like before industrialisation and intensive agriculture brought changes to every aspect of life. Wardown Park Museum has drawn on its collection of works by both artists to create a charming display which is open to the public, free, until 14 November 2010. Thomas Fisher was born in Kent in 1772 and employed by the East India Company in London but had plenty of time to employ his talent as a finely detailed water colourist to record the buildings, monuments and landscape scenes associated with Bedfordshire’s main landowners. 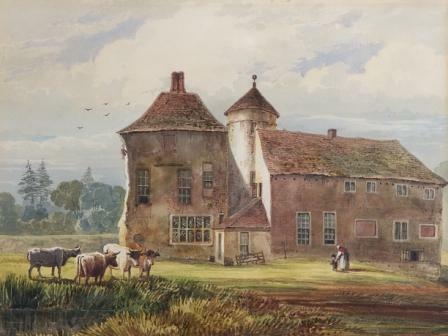 He was particularly interested in the local villages and landscapes which he visited during the summer months of the successive years from 1812 to 1822. His work resulted in the publication of two volumes Collections Historical, Genealogical and Topographical for Bedfordshire (1817) and Monumental Remains and Antiquities in the County of Bedfordshire (1828). George Sidney Shepherd was born in London in 1784 and became a professional artist who travelled throughout the country producing sketches and paintings for both publishers and for private commissions. On one trip to Bedfordshire he met and subsequently married a young woman from Stanbridge. Helpful captions provide useful historical background material on the subjects depicted.The exhibition, though relatively small, is a delight and I can thoroughly recommend it. Dr. Elizabeth Adey, curator, will give a talk on the two artists and the exhibition at Wardown Park Museum on Thursday 4 November at 2.30pm. Entrance to the talk is only £1 but you are asked to ring 01582 546 722 in advance to book a place. Thanks to Stuart Antrobus and Elizabeth Adey for this contribution.